Cunard are also having a big day at Southampton this year, and it will be in just over a week’s time. It will be held on Jubilee Day, 5 June. All three Queens – the whole of their fleet – will be in Southampton together. The day will feature a program of events unit well into the evening; in fact the ships aren’t schedule to leave until around 11pm. Full details of the programme can be found here on their website. Between 9pm and 10.15pm, the ships will reposition, creating a three ship formation around City Terminal. That’s an interesting manoeuvre in these very safety-conscious times. According to the Southampton VTS website (which lists scheduled cruise ship calls at Southampton for the whole of the year), during the day Queen Victoria will be berthed at the City terminal, Queen Elizabeth at Mayflower, and Queen Mary 2 at the Ocean terminal – presumably she’ll have to emerge and then back up a bit to get close to the City terminal for the ‘three ship formation’. 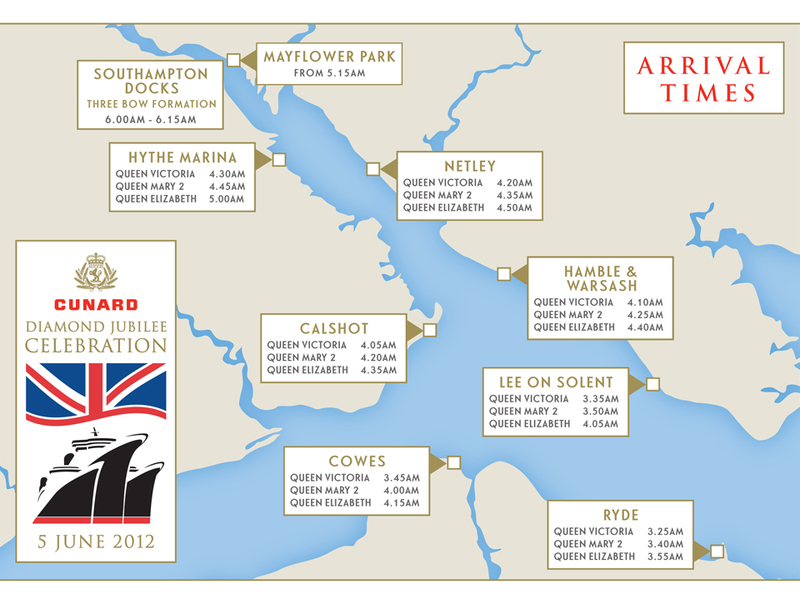 Cunard are obviously expecting people to be seriously interested in the three Queens gathering. Whereas P&O have published a map showing spectators the times at which good views can be had during the departure on the P&O 175 event – i.e., during the evening of 3 July – Cunard have published a map showing the expected times of the arrivals of their three ships on the morning of 5 June. This starts at 3:25am, off Ryde, and culminates with what they are calling a ‘three bow formation’ in Southampton Docks at 6am. The most recent Three Queens gathering at Southampton was on 22 April 2008. At that time the ‘Three Queens’ were Queen Mary 2, Queen Victoria, and QEII, so it wasn’t quite the same as the forthcoming event. Also that gathering was unscheduled – QEII was only in Southampton because she was having some remedial or repair work done, and she should originally have been at sea. But she wasn’t, so the unexpected gathering happened. I blogged about it (and some other Southampton ship arrivals) here. Finally, it’s worth remembering that the three Queens will be together again in Southampton on 13 July. You’ll miss all the extra events, but I expect there will also be fewer spectators. I shall be there for this second event but not on 5 June.